The e-cigarette lobby won a little victory today, when the American Heart Association issued a policy statement that does not condemn vaping. That's not exactly an endorsement, though. Aruni Bhatnager, lead author of the statement, summed up the AHA stand well in an interview with Bloomberg. "If people cannot quit at all and have tried everything in the field, we would not discourage them," Bhatnagar said of e-cigarettes. "It's not something that we would suggest." He added, "We do not know for sure and the jury is still out whether or not these e-cigarettes are safe to use, so we do not say that they're safe." That's a very reasonable position for the biggest heart health organization in the country to take, since—well—nobody knows if e-cigarettes are safe. There is also plenty of sort of scary evidence to suggest that they're not safe at all. The AHA admits as much in its policy statement. 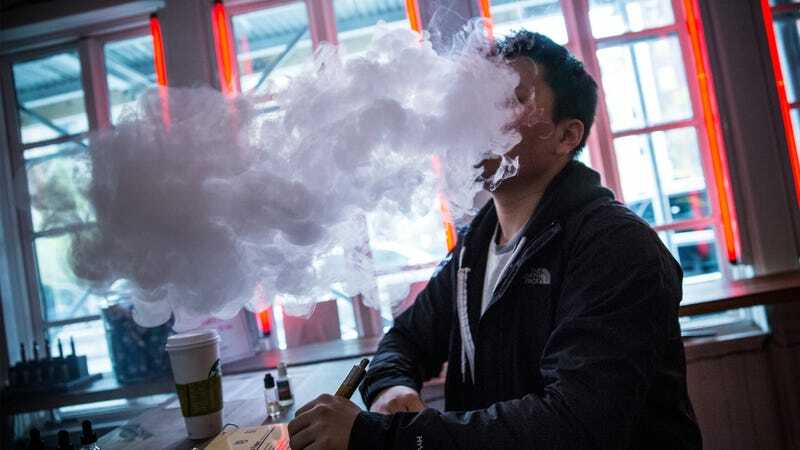 "However, subjects should be informed that although e-cigarette aerosol is likely to be much less toxic than cigarette smoking, the products are unregulated, may contain low levels of toxic chemicals, and have not been proven as cessation devices," the statement reads.